Discussions with children about online safety often revolve around the topics of cyberbullying and avoiding online predators, but what about staying safe from cybercriminals? It's quite easy to think that hackers and nefarious actors out there are only after adults. However, kids are just as likely to be targeted. We've compiled a few ways to keep your kids safe online that you can read about on the Webroot blog. What I'm most curious about is hearing from you, the Webroot Community. How do you keep your kids safe online? Did we miss anything in our post? Let's kickoff a discussion in the comments below and share real life examples so that everyone can benefit. 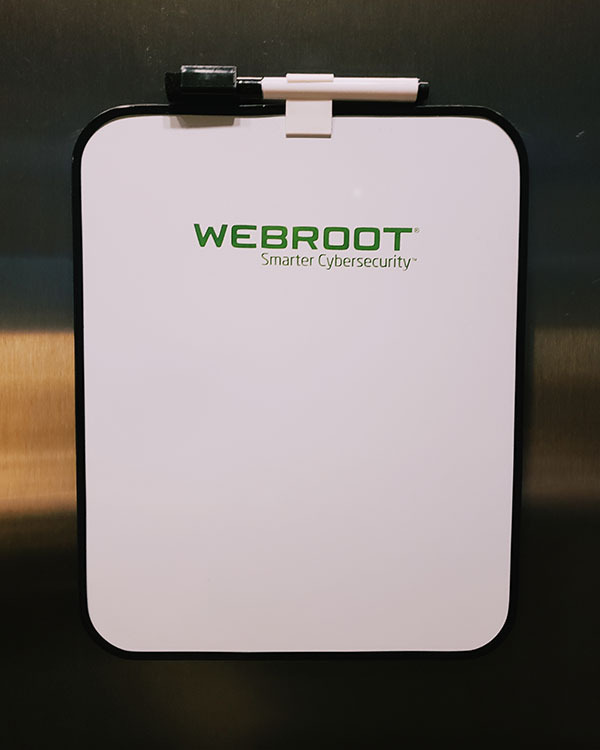 For those of you that open up and share, we'll be giving away a Webroot whiteboard and laminated #CyberSmart checklist until we run out for you to reference. 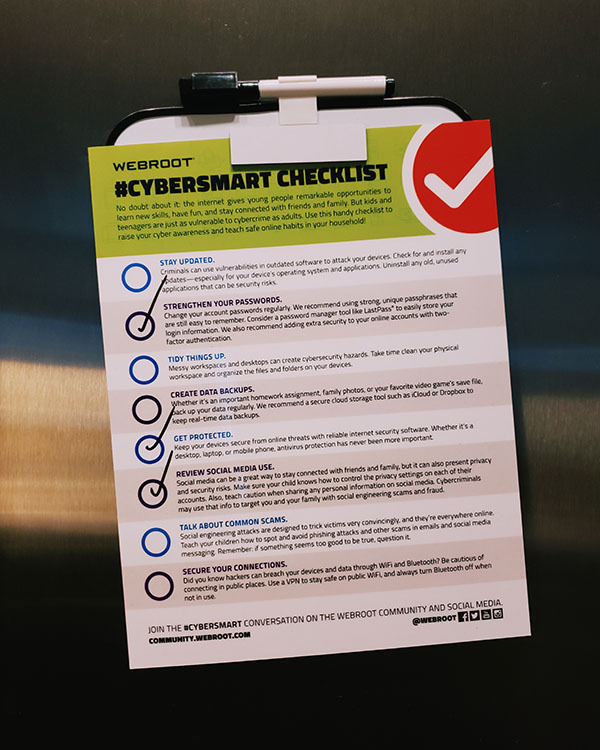 Our hope is that our checklist will act as a friendly reminder to always be mindful and keep cybersecurity for you and your family top of mind. Great article. I would just add that it is very important to start online safety at an early age. Many children as young as preschoolers are using tablets and computers for standardized testing; parents give their personal phones/tablets to their children to use for entertainment, etc. It is important to utilize app restrictions, age restrictions, web filtering, time limits and keep a close physical eye on them. Take YouTube as an example; it is a wonderful platform full of very educational materials; something as simple as watching your favorite cartoon character can eventually lead to videos that are not age appropriate due to auto-playing and user created materials. My son got scammed by someone whom sent him an email to get his Apple username and password. There was a game running at the time (cant recall exact one) and he received an email to get more credits for free. He 'logged into his apple account' and within 10 mins lost complete access to it after getting an SMS to say that the main email is now changed. This was before Apple put in 2FA. I emailed the person asking for the account back or we would go to authorities. The person just replied saying do what you like but you have no authority where I am. google-antifraud-security@gmail.com (I m sure you know where I am going with this now) - now closed. I emailed this person very officially with Google logos and Security Badges in the signature and got an instant reply saying "Im only a kid, am I going to jail?" I asked for all the website and links as well as the password to "our clients account" which he completely complied with. After I got the password back and account in my sons hands, i then taught my kids how dangerous the internet is and what if that was a bank account? The other person kept emailing asking PLEASE TELL ME< AM I GOING TO JAIL? panicking and worried. I never further replied so I am sure he sweat it out for some time. After about 4 hours, I started getting notices from Google saying, this email address/account could be phishing scam, which it was. Morale of the story is the kids are NEVER to young to teach security. That article has some very good points. Thanks for posting it. I also think the real way to keep your kids safe is, as the article calls it "frank conversations", and also to be open with them about the dangers on-line. Have a straight-talk with your kids about what is allowed, and what is not, and be open to then asking you if something is OK or not. Sure, you can add all kinds of "limits', but kids can be very creative and end run all these things. They need to be able to ask you without worrying about repercussions if something is out of bounds or not. I shared it. It is good stuff. I also do this training for most of our clients as well and people walk out scared of the internet, which is good! It makes them understand that sitting in a dark room with the door locked does not mean they are safe or in private. Thanks @sealey. Couldn't agree more that it's important to get kids thinking about cyber safety at an early age. Kids are growing up with a tablet/phone in their hand; technology, in this way, is a part of the human experience. Thanks for the comment and sharing. Wow, what a story @pacman02! That's incredible. I'm glad that you got everything back even if you had to fight fire with fire. That's brilliant! What a great lesson too for your son. @MajorHavoc you're welcome! Glad you liked it. Yes, this can't be stressed enough. Having those frank conversations are really important. The internet can be an incredibly positive place but at the same time absolutely horrific. It's important that children understand the dangerous early on. Kids aside, keeping everyone safe online is important. Being in the IT industry, you see that there is always someone out to get 'you'. By preying on children, the elderly, and everyone in-between, it's important to be as safe as you can be. DNS Filtering - If you have edge protection that blocks Ads, Malicious Websites, and 'Unsafe' Websites, your children are less likely to find some nefarious websites on Search Engines as they will be blocked. Kid friendly devices - There are specific devices, such as the Amazon Fire Kids Edition that is tailor made for children. What better way to keep them safe by having a product designed for their daily use. As someone who does not have children yet, I know that my thoughts on the topic will likely evolve over time, but here is my current opinion. I completely agree with all points in this article. Kids today do not truly understand the impact their online presence can have on their lives. One wrong click or a bad message can have negative effects on their future career or education goals. I think that the best thing for parents to do is to stay in contact with your kids and have open discussions when possible. Monitoring tools are good, but you must still allow them some sort of freedom to make their own choices. At the end of the day how someone chooses to protect their kids from the dangers of the world is their own choice, but I believe providing them with training and knowledge is the best tool that you can give them to remain safe on the web. Todays kids are more tech savvy than most of their parents and I believe that this will only become more true as time progresses. At the end of the day breaches can happen to any of us. Articles like this one are great to share with kids as well as adults. We all need to remain aware of these threats and act accordingly. I look forward to reading the thoughts of others and learning from their experiences and suggestions. There are a couple of rules that my kids have learned that seem to help. 1) nothing is free, you should be able to understand where they are making their income. If not it’s something sneaky. 2) the only way to never have a picture or video leaked online is for it never to be taken, so just make sure that every picture or video of you would be ok for your grandparents to see. I completely agree with the article. You can't discuss internet and general safety enough with your kids. I had an experience with my daughter that I never thought would happen. I also had an experience with my son that I never thought would happen. I was on top of it and tough love taught them a very valuable lesson. Kids and adults need to be reminded on a regular basis about internet safety, which is why I push the Webroot internet security training! Great information thank you for sharing! I think it's also important to tell them be careful what passwords you type in when connected to public wifi. You never know if you have connected to a hackers hotspot with a key logger catching all the information you type in. My kids (both teens) haven't been an issue online. The oldest doesn't venture too far from Netflix and Youtube. Email is barely used and she comes to me for help when she needs it. Last time was something along the line of "I got an email saying my Paypal account needs verified." I asked if she had Paypal and she said no. I explained the scan to her and she's been smart about it since. My youngest games and does a little more online than her sister but hasn't ventured too far. Once, she came home from school and asked me about something she heard at school involving a couple girls and a cup and we had a conversation. Thankfully, she asks first if she's not sure and takes my advice to stay away from things. Her passwords are mighty, unshared, and changes with some frequency. My kids basically know, that EVERYTHING imaginable is online somewhere and it's forever. They're being careful where they go and what they post. Growing up with it from day 1 has helped. Their mom got online later than most and has had a harder time recognizing scams and realizing a couple wrong clicks or posting too much information can go wrong quick. I really like to see articles like this, online safety for children is a big concern for us parents. Kudos for doing good work. Education. I believe in educating on the reasons why to avoid clicking links in emails, verifying https, correct URL, etc. will help with compliance. Telling stories and experiences of their peers who failed to stay secure online will help provide them a guide & motivation to not become another victim. I don't have kids, so I can't really participate fully. However, education is the key here, the more they know the better they are at preventing it from happening. -Start early. Teach your children that when someone offers you something for free, there's almost always a catch. Train them (in basic ways, then more advanced as their ability to understand grows) in basic critical thinking skills, so that before they make a decision, they stop to think about it. This is a hard task, as younger children are often very impulsive, but it's worth doing. It requires a lot of repetition. -Teach children that once something is on the Internet, it's there forever. I used to use a few ads from the American Ad Council's "Think Before You Post" campaign released in 2007. They're still available on Youtube, and highly relevant. Teach them how just deleting a post, picture, or anything they've placed on the Internet isn't just "gone". In the process, ensure they know about the consequences of good and bad decisions, and that consequences can last for years (again, difficult, because children often only think in terms of the immediate future, or even less). -Teach children about their identities, as well as others. Show them how easy it is for someone to hide their identity (e.g. "On the Internet, nobody knows you're a dog" comic that we've all seen). Teach them that people aren't always who they say they are, and once again, critical thinking. -Teach children positive self esteem. Give them the power to say no, or to not do things they don't trust, and to let you know as an adult that you're safe to come to in the event something seems wrong, even if they made a mistake in the moment. You'd much rather hear about a mistake from them than you would from their Facebook page. You'd also rather they came to you or gave them the confidence to make a good decision than let their crush of the moment pressure them into something (be it online or offline) with repercussions. -Look at systems that involve graduated trust. An example of this is an app my colleague uses called "Our Pact" which works on tablets and smartphones. It does not spy on children, which decreases trust. Rather, it allows app use at specific times, or on an allowance system, or denies usage of certain applications. These may be relaxed or allowed and are remotely controlled, and so as a child gets older, restrictions may be relaxed. Never make your first message "I can't trust you"; make it "I want to trust you, but I need you safe too." -Having a good web blocker or DNS service isn't a bad thing for ads, malware, or categorized unsafe websites. This also can be done without monitoring, making it less intrusive. Great article. My daughter is still young (7 will be 8 shortly) so teaching her about internet safety is an ongoing priority. I gave her an old phone that she uses under supervision and she only to play games as of now. She gets to use the desktop pc as well for educational purposes again with supervision. That way as things come up like phishing scams and other assorted internet issues arise I can teach her how to handle them. A big issue was teaching her how to discern ads in games and not click on them. Be it the banner ads or the pop-up ads or the video ads that are all to common in mobile games just so you can continue playing. Now, she has the patience to wait for the little "X" to show up so she can safely close the ad without navigating someplace else. But, I need to be vigilant and continue to teach her to be vigilant about internet security. Teach the value of good passwords and to never share a password. I also check their devices from time to time to see what they have been doing and where they try to go on line. Web Filtering helps too. I find it is very helpful to teach family members to be cognizant of scams, especially considering there are a lot of them these days. Everyone in my family knows not to give out private information and to be suspicious of random unexpected requests for private information. Our children are grown up and moved out, but they were teenagers as the internet and cell phone age was taking off. My wife and I knew there was no way we could shield our children from every threat they'd come across on the internet. We chose to be actively involved in our children lives, encouraged them to express their opinions and share with us freely the things they come across. We avoided being 'buddies' to them, but made sure it was an environment of mutual respect. It was a two way street. When the wife or I came across something, we'd talk about it as a family. It was a bumpy road at times, but we all survived and I feel we're all equipped to handle internet threats, recognizing as the threats evolve we also need to keep up. I am teaching my children (8 & 6) that almost all places are trying to pry money away from you in one form or another. Also, there are people out there who don't know you and simply don't want you to be happy. That starts very simple conversations. But I am currently in the evaluation process of wifi appliances that allow me to cut off access after certain hours and will allow me to block certain sites. Of course that is a losing game because once they're older they will find a way. I guess my biggest effort goes into education and critical thinking. I pair that education with oversight as they are using the Internet.